How does one make journalism cinematic? 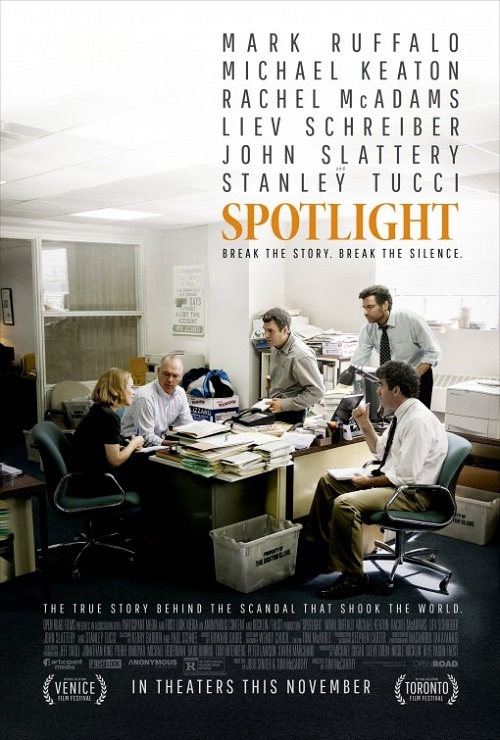 Tom McCarthy's Spotlight (2015), along with James Vanderbilt's Truth (2015), are two efforts that have creatively tackled that challenge this year. Both explore the nuts and bolts of investigative journalism. As an investigation is, in essence, an issue of time, cinema—with its built-in strengths to compress, elongate, conflate and manipulate time in the service of narrative—has proven to be, perhaps, the best tool to express the journalistic process. At a recent San Francisco screening of Spotlight, introduced by Chris Columbus, with an on-stage conversation between Tom McCarthy and noted American journalist and editor Phil Bronstein, I had the opportunity to ask the following. Michael Guillén: Almost every feature film I attend these days is prefaced with the caveat that the film is "based on actual events" or "based on a true story." Clearly, Spotlight is based on the Boston Globe's investigation into the Catholic Church's systemic cover-up of pedophilic priests; but, my question would be what is fictional in your film to help shape this narrative and make it engaging for an audience? Or is there any fiction here? Tom McCarthy: Yes, of course, if it was a six-month investigation told in two hours. But, more often than not, it was dialogue and interior moments that we had to get to, no major story moments. There was some conflating and moving of moments here and there; but, what Josh Singer and I specifically resisted was trying to create drama through fictionalizing moments. There weren't many scenes that we didn't feel that—if they weren't wholly accurate—were at least accurate to the spirit of what the investigation was. I would be hard-pressed to come up with a moment where I could say, "No, this was just absolutely fabricated." Not many of those exist. The reporters, who have been kind enough to come on the press junket with us, who have been involved, and have been really wonderful participants, they'll say things like: "Well, in the sequence where we went through the directories, the film shows that in a two-minute montage with Howard Shore's beautiful score, but those were three of the worst weeks of our lives." Sacha Pfeiffer said she literally had to get prescription glasses after that. They also admitted that they didn't know if all that research was going to add up to anything. They were flying blind at that point. So there was a lot of that, where we had to play with that fine line. A lot of what the Spotlight team did is tedious work, but we didn't want the film to feel tedious; but, we also didn't want to sentimentalize, romanticize or sensationalize it. The Spotlight team agreed to be part of this project; but, in my mind, it took about nine months to a year for them to really open up. I don't think they trusted us. They were nice, they were smart, they were engaged in giving us facts, but ultimately we needed to get inside them a little bit more. Even though we didn't spend a lot of time with their personal lives, I needed to know emotionally where they were at with these different beats, and that took a while. Even now they would admit they were not certain of how we were going to handle this.